Currently viewing the category: "Hot or Not"
Money seems tight everywhere these days, but that doesn’t mean Murphy’s Law has taken a vacation. On any given day the car brakes might start squeaking and need new pads, the water heater could stop working, the check engine light could come on, or the lawn mower could quit. No one’s an expert on everything, but with a simple online search a Toolmonger can locate how-to websites or videos. There’s also Smartflix, a DVD rental Netflix service for the “How-to”er that Chuck wrote about a few years ago. I’ve found a number of these videos, websites, and forums incredibly useful in the last couple of years and can’t think of a better way to help get the job done on my own. We get lots of crazy press releases here at TM, and a lot of ’em go right in the circular file. This one, however, caught my eye. Looking past the AS SEEN ON TV feel, it seems to address a real problem: your hard hat can only protect you if you’re wearing it. 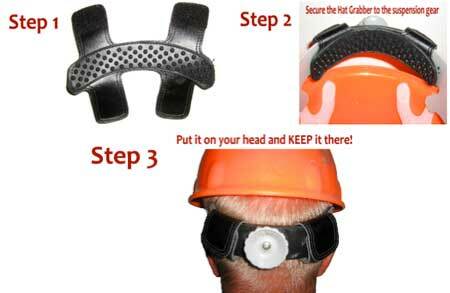 The Hat Grabber site claims that on job sites, workers often take off their protective headgear because “they won’t stay on your head, they’re uncomfortable, and they fall off when you bend over.” Their product — a grippy pad — fastens to your hat’s suspension gear, adding a little bit of padding to make it more comfortable and to allow you to crank it down tightly enough to stay on your head. At least two companies market the equivalent of professional-grade drywall banjos directly toward remodeling consumers: Buddy Tools and Homax. 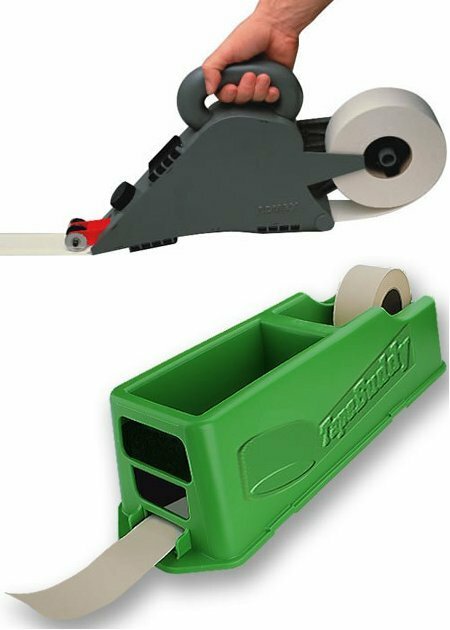 Their tools are plastic versions of the more expensive metal tools used by professionals to dispense tape coated with just the right amount of drywall mud. 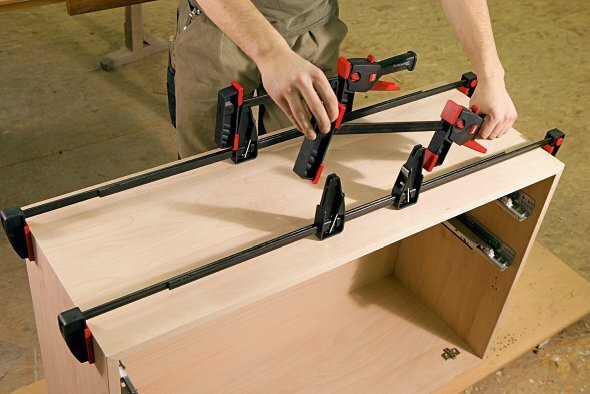 Bessey’s clamp extenders let you use a small clamp to do large jobs. They made the extenders to be used in conjunction with their DuoKlamps, but they should work with just about any clamp larger than 6″. The extenders can be used to clamp workpieces up to 65″ with 260 lbs. of force, or you can reverse the jaws to spread up to 70″. 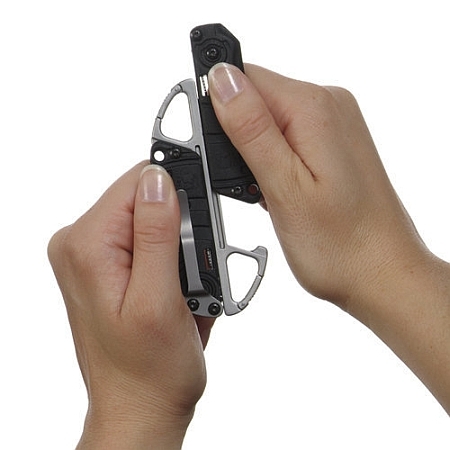 CRKT has a new multi-tool “chassis” that consists of a dual-carabiner center section to which you can add various tools. 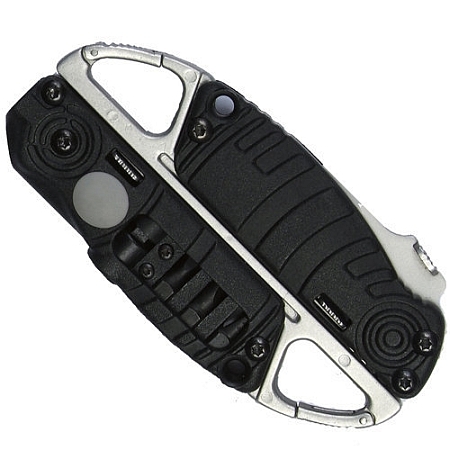 For example, shown above is their $59.99 GoWork Pack comprising the chassis, a knife, and a hex driver. The various components slide onto the center chassis as shown below. Selected as one of 11 Popular Mechanics Editor’s Choice Awards, the patent-pending doubleVsquare was designed by carpenter Ray Atwood and introduced at this year’s National Hardware Show. This square, which lists for $24.95, has all the functions of a standard triangular square tool, plus it folds open to a 90° square and allows you to mark two sides in one motion (as shown in the above picture). When it’s folded flat, it gives you a larger straight edge. 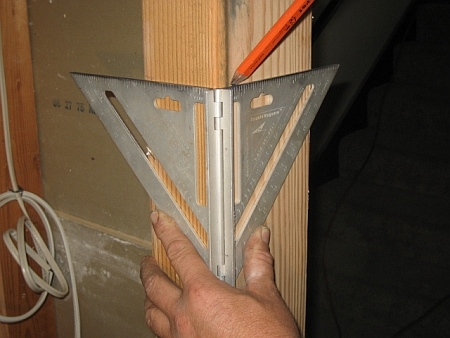 When it’s folded closed, it takes up the same space as a speed square in your tool belt or toolbox. What do you think? Will it replace your layout square? Let us know in comments. The Blum Tool Company’s Bench Horse™ “original” is an 18″ × 48″ portable workbench designed for easy setup (“…less than 15 seconds!”). 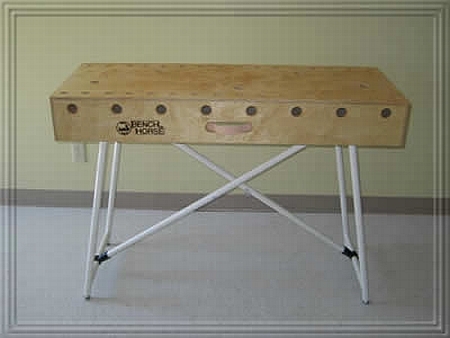 Weighing in at 55 pounds, this workbench can be used as a jobsite bench or a storable main bench in your small shop. 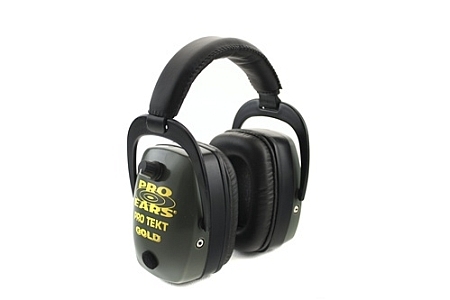 I’ve always used passive hearing protectors (like the Peltor 10A; see TM 11/2/07) when I’m in the shop (or mowing grass, or having a “discussion” with my wife), but have wondered if the electronic, or active, versions offer any major advantages. For example, the Pro Ears® Pro TEKT, pictured above, have DLSC™, or Dynamic Level Sound Compression technology, which compresses all sounds over a 70-dB threshold by 50% (to “a safe level”) while amplifying all sounds below the threshold. They claim the result is that the wearer hears everything, like normal conversation, but is protected from dangerous high-volume sounds. Invented by British product designer Chris Elsworthy, the Power8 Workshop’s case converts into a tablesaw, scroll saw, or drill press (in which case the tablesaw’s fence becomes the upright for the drill). 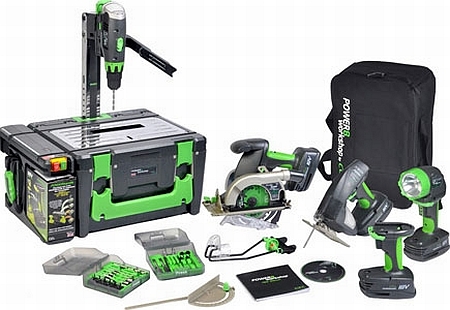 The kit comes with four cordless tools: a 5-½” circular saw, a jigsaw, a variable speed 3/8″ drill/driver, and a flashlight. An assortment of drill bits, driver bits, and jigsaw blades plus a soft tool bag are also included. 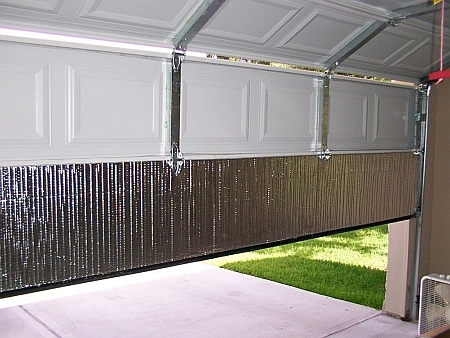 What’s the word in Toolmonger land regarding the pros and cons of insulating garage doors? The picture above shows the beginning of an installation using a reflective foil kit, one of the apparently three main DIY approaches (the other two being foam panels and fiberglass rolls). Texas Garages is one site that discusses and compares the various approaches. Costs to do a single garage door range from $69 to $129.